Shockingly bad numbers for the NDP. That's a very thin 12%. Weak in every region, and Bernier nearly a preferred choice for PM over Singh. Anyway, I guess I'm in the 1% supporting some other party now, except I don't believe that party exists yet. Provincial Liberal parties losing power in BC, Ontario, Quebec, and New Brunswick seems to have enhanced the popularity of the federal Liberal government. Since following politics more closely one surprise was realising how much weight factors other than platform matter in winning elections. The CAQ is in power largely because the Liberals have been in power for 15 years and they are also in power federally. It was a change election. Trudeau also benefited from 2015 being a change election. I still marvel over 2015, that all three parties were in first place in the months leading up to the election. Had it not been a change election I think Harper would have won again. Had Layton not passed away I think he would have beaten Trudeau and I think he would have caught the Corbyn/Sanders wave. Trudeau benefits in contrast to Trump and Ford. He has really messed up on the pipeline file. He's managed to alienate everyone. Canadians did not want him to buy the pipeline. Last I heard they are trying to figure out a way to give it to First Nations; a gift I hope they will refuse. 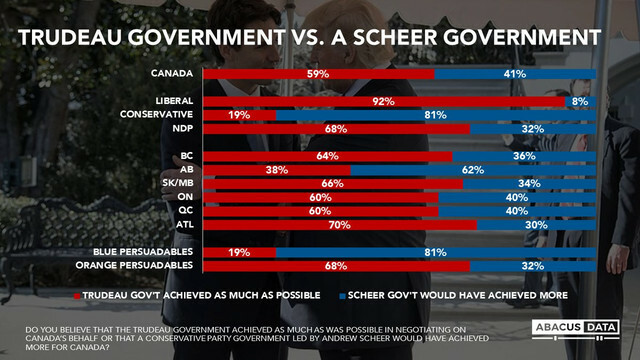 I think were it not for factors surrounding him, including Scheer, he would not be doing nearly as well. Canadians may hate all their options going into the next election. Makes the result quite unpredictable - especially if one option is suddenly liked during the campaign. It could be a low turnout and the base of one party could prevail. While I think that Trudeau has the advantage, in such an election the unpopular opposition could win and that could be scary -- it could also win with an unpredicted balace going to Bernier. This would be the worst possible result. Enough may think this that Trudeau gets an even bigger majority. There is no data set now that can predict this. I think the NDP will try and in some cases fail to save the furniture. In a Nanos Research poll conducted for Bloomberg, 39 percent of Canadians say Trudeau is the best for managing ties with the U.S. president. Another 22 percent say none of the leaders are best suited, while 21 percent chose Andrew Scheer, a conservative who is Trudeau’s top rival. Another five percent of respondents said Maxime Bernier -- a former Conservative lawmaker who quit Scheer’s Conservatives and is launching his own populist party -- was best for dealing with the U.S. President. Green Party Leader Elizabeth May, who is her party’s only federal lawmaker, was chosen by three percent of respondents. Just one percent of respondents picked Jagmeet Singh, leader of the New Democrats, who have the third-most lawmakers in Canada’s House of Commons and regularly poll in third-place in Canada’s multiparty system. “For a party that’s in the teens, to have your leader at 1 percent, it means that even in your own tribe, committed NDP supporters do not believe Jagmeet Singh is the person to best manage the relationship with the president of the United States,” Nanos said. Nelson Wiseman, a University of Toronto politics professor, agreed that Singh isn’t doing well and that’s not really surprising. But he said one year is a long time to change things — especially considering it’s what happens during the election campaign that really matters. “During the election campaign, Jagmeet Singh is going to get a lot of coverage. The fact that he isn’t well-known now doesn’t mean very much,” he told Global News. Thirty-seven per cent of Canadians said they would “never” vote for the Tories, compared to 49 per cent who said they would not vote for the Liberals and 50 per cent who ruled out the NDP. The conservatives have the largest voting pool. On the other hand, this week's Nanos poll indicates that 52% of voters would consider voting for the Liberals, 44% would consider voting for the Conservatives, 36% would considered voting for the NDP, 30% would consider voting for the Greens, and 11% would consider voting for the new People's Party. In Quebec, 26% would consider voting for the BQ. So Nanos indicates that the Liberals currently have the largest voting pool. He noted that the added attention could be a good or bad thing, but it’s too early to tell. “All the time between now and August is irrelevant,” Wiseman said. Conservatives are always nasty, so Scheer Nonsense is just giving people a heads up. Trudeau is finished, thats the only hope liberals are left with, a minority. Not going to happen. Its PM Sneer time. Want to try that again? Trudeau is finished, thats the only hope liberals are left with, a minority. Not going to happen. Its PM Sneer time. Strong leadership with a smile (if you know what I mean). But this sentiment is expressed around here in different words all the time, you have to just read between the lines. I just tried to put it in simple words without hiding my true intentions/wishes. gadar must be the resident Conservative on this board. Don't bait please. Taking a position that Scheer is likely to win the next election is not in any sense an endorsement of the Conservative party. Yeay? Cons are right there, lets pop the champagne. But NDP wont be the official opposition with those numbers. Oh well one cant get everything. PM Sneer is fine for now. Oops sorry bekayne, its PM Andy Pandy, well cant be any worse than the fancy socks boy. Strong leadership with a smile. If we include all the polls taken during the last seven years the Liberals could be in third place!!! Different ways you can find a median poll -- one is to knock out all the extremes - take the top two and lowest two for each party and you are left with 4 polls that have no outliers. This comes close to the average of all but it is done without risk of the extremes distorting things. If we are looking for an accurate number assuming no changes over time it is another way. Polls taken more than a month ago may be dated because Ford's premiership in Ontario and, to a lesser extent, Legault's premiership in Quebec seem to be helping the popularity of the federal Liberals. The latest Ontario provincial poll has the OLP in second place to the OPC's, and the ONDP in third place. My post was in response to an earlier post quoting the just the avergaes. I wanted to give a detail breakdown behind those averages. And you are right that the polls can be interpreted in different ways and I would like to add that one can find what they are looking for in those numbers if they tried hard enough. For example I could just claim that Nanos is just noise and fake poll to push an agenda while Forum and Campaign Research are the only two that should be taken seriously. Doug Ford's government seems to be hindering the Conservatives and helping the federal Liberals and federal NDP. Do you have the evidence to prove this? I am wonding about it but have not found definitive answers. On the one hand we have the Bernier party story, which even if he does not pick up seats or popularity, he makes the Conservative leadership look inept. On the other, there is the Ontario story. Do you have any provincial polls that are recent? I have not found any since the summer ones showing the NDP drop, Liberal rise and the PCs still on top. I am not saying you are wrong but I am not sure which is the most significant factor -- even if there is a single one. Also the NDP has gone up and down. We would need to see the NDP out of the old 15-21% range into the mid 20s - like 24-26 to know that this was something really hopeful. I also wonder what is happening in Quebec. If the new CAQ government gives the province a bad taste from the right -- is there an opening the federal NDP could have to get back in the conversation? -- Can the NDP discuss un avenir progressif? Two recent Ontario provincial polls have shown PC numbers going down and Liberal numbers going up to the point where the OLP is just 3 and 2 points behind the PC's. I think this huge change from the end of the Wynne era is impacting the federal scene. I think Wynne's previous government was harming the federal Liberals and Ford's government is now harming the federal Conservatives. No progressive should ever want the ONDP to be behind the OLP, though. No possible good can come of that. I agree that it is disconcerting that the Ford government's reduced popularity hasn't increased the ONDP's numbers. I think it would be great if Ford's government was relegated to 3rd place in the polls with the ONDP in first place. 21% NDP support in BC versus 26% in the 2015 election. Liberals unchanged at 35%. It would appear that opposition to TMP is not getting results for the federal NDP in BC. The biggest problem the NDP has is its leader. Singh's approval numbers in that poll, as in other polls, are terrible. The NDP could have the best policies in the country, but if people don't want Singh to be PM any more than they want Elizabeth May to be PM, they won't vote for the party. I think the NDP missed the chance to gain publicity for the new leader following the leadership. There of course is another opportunity at the time of the election. It is hard to say what will happen then and if he will do well against Trudeau and if he has a message that will connect. I think that the profile of Guy Caron has not been high enough either, something needed in Quebec. Math may not be so hard after all but politics is and the NDP struggles to find the formula but due to the publicity of an election it is much to early to write them off. Singh does not have to match Layton, but I think he has to avoid under-performing compared to Mulcair. His polling hovers above and below Mulcair's vote and I think consistently below in terms of distribution give the low Quebec totals and more spread out support. Without adequate concentration the party is at risk of losing party status even around the 20% mark if distribution is not good concentrated enough. The party could hang on to status due to some strong sitting members but as we saw in the last election this is no guarantee. That said the numbers are likely to be close. A good campaign and a net of 25% could see the party with gains while a 20% (still an increase in popular vote) could see steep losses. In Beauce, recently nominated candidate Richard Lehoux of the Conservatives has 37.9% support, while Bernier has 34.7% support among decided and leaning voters. “Bernier narrows the gap when we ask Beauce residents which candidates they would vote for,” continued Maggi. “But there is no mistake that Bernier would be in trouble if the election were held today. Finally, 35.9% of decided and leaning voters in Burnaby South said that they would vote Liberal in the upcoming by-election, while 29.3% said that they would vote Conservative. 27.2% said that they would vote NDP. “Given these numbers, it is surprising to see the NDP clamour for a by-election”, concluded Maggi. The Tory nightmare now is the fall of the NDP. "That's where I'm actually worried, frankly — from a strategic perspective, that's what I'm watching," said Alexandre Meterissian, a conservative strategist with Montreal firm Hatley Strategy Advisors. "The collapse of the NDP is a big problem for the party." Meterissian in particular is concerned about a Mainstreet Research Poll published Nov. 14 that had the Liberals with a comfortable lead and the NDP down at 10 per cent, barely ahead of the Green Party. That was an unusually bad poll for the New Democrats but Meterissian said there is a downward trend for the party and leader Jagmeet Singh, who is struggling with caucus discontent and communications problems. Meterissian said the Conservatives need to figure out how to attract NDP voters in Quebec and northern Ontario, because otherwise those votes will all go to the Liberals. So what you are saying is that it is a bad thing for the NDP to do well because it would put the Conservatives in power? Keeping their distance from Doug Ford, who has made himself toxic to francophones in Ontario and Quebec, would have been a good start. But it may be too late now. This may not be true actually. If the Conservatives are relying on the NDP it does not mean they are in contention. However, the collapse of the NDP could be the difference between a respectable opposition for the Conservatives and a massive Liberal majority. We are still far enough from voting day but there is a reasonable chance that the NDP is in deep trouble. As I have warned in the past these numbers can be discounted somewhat as the NDP is more spread out than it was historically. When Audrey McLaughlin was around the party got just under 7% and held nine seats. It had just about nothing in Atlantic Canada and nothing in Quebec in terms of support. It was concentrated somewhat due to those holes. Today the party has low levels of support in Atlantic Canada, not enough to get seats but considerable wasted votes. Quebec could end up in the same position. This means that the party could lose party status with a much higher but more evenly distributed vote. With a number not running again we would be looking at a very low number of surviving strong candidates. Of greater concern is if the Conservatives poll low - some polls have them in the 20s and Bernier polls a couple points, the Liberals could get a massive majority. It is possible that the NDP should also be concerned about a low Conservative vote as well. In this perfect storm the NDP could see a result easily in the single digits. This would mean that the damage done will be that the next leader may be ignored as insignificant and the NDP could face a generation before they get any significant attention again such that the next leader could start so low that no matter how good that person is, they may have no chance. But this is not a return to the bad days for the NDP -- it could be much worse than that. There is also a real possibility that the Greens could hit 10% and get more seats than the NDP with the NDP around 15% due to distribution. In this case, under the current environmental context, it is possible that the Greens could rise over the next few elections choking off the NDP. Long time New Democrats might see such a scenario as a disaster but effectively if it created an effective real merger between the left and the environmentalist, pushing the Greens to the left, that new version of the Greens could end up being strong enough to contend for power. With the Greens and the NDP this close together, it is very possible that when Elizabeth May retires that the next Green leader could come from a left-environmental position of both social and environmental sustainability and eclipse the NDP on the way up. While this is not certain, it is possible that we are seeing the end of the NDP federally as a significant force for the foreseeable. It is not even certain that this would be a bad thing. A strong NDP would mean that the next generation change in the Greens would result in that party remaining a more rightward, environmental party. A weak NDP would open up the possibility that the Greens could move left and be a more holistic sustainability party. Alternately, I would be happy to see a new party called the Sustainability Party to come from a formal merger between the NDP and Greens based on the understanding that real sustainability must be both environmental and social. Both types of sustainability rely on the other. In the present context, if either the Greens or the NDP falter and the other is successful, you would not need a formal merger to get an effective merger, although a former merger would speed up the process. I believe such a party could win and more importantly make the changes we need. Alternatley this might be the darkest days of the Singh leadership and he could perform better than expected in the next election. The difference between the two scenarios may be extremely narrow and be decided by very little. Some of the above comments and headlines are obviously misleading. "Right-Wing Media slams Equality-Minded and Progressive NDP once again."